Police arrested dozens of suspected mobsters in Europe and South America on Wednesday (5 December) in a huge international swoop targeting Italy’s notorious ‘Ndrangheta mafia clan, officials said. Nearly 90 people including high-ranking members of the powerful organised crime syndicate accused of drug trafficking and money laundering were arrested in coordinated raids in six countries, EU justice agency Eurojust said. Today, @Europol, @Eurojust and authorities from ?? ?? ?? ? ?made a decisive hit against one of the most powerful Italian criminal networks in the world. The “unprecedented” crackdown on the group based in Calabria, southern Italy, came just a day after Italian police arrested the new boss of the separate Sicilian mafia. Hundreds of police took part in Wednesday’s operation, seizing four tonnes of cocaine, 120 kilos of ecstasy and two million euros (dollars) in cash across Germany, Italy, the Netherlands, Belgium, Luxembourg and Suriname. “Today, we send a clear message to organised crime groups across Europe,” Filippo Spiezia, vice president of the EU’s judicial agency Eurojust, told reporters in The Hague. He said the “unprecedented and extraordinary result”, the fruit of a two-year operation, targeted “dangerous members of the ‘Ndrangheta family deeply involved in drug trafficking and money laundering”. The ‘Ndrangheta — which derives its meaning from the Greek word for heroism — is made up of numerous village and family-based clans in Calabria, the rural, mountainous and under-developed “toe” of Italy’s boot. It has surpassed Sicily’s Cosa Nostra and the Naples-based Camorra in influence thanks to control of the cocaine trade and is the sole mafia organisation to operate on all continents, according to anti-mafia prosecutors. Officials hailed Wednesday’s operation — dubbed “Operation Pollina” — as a serious blow to the group. In total 41 people were arrested in Italy, 21 in Germany, 14 in Belgium, five in the Netherlands and two in Luxembourg, with operations still underway, Eurojust said. Italian police said the sweep targeted the ‘Ndrangheta and its “projections across South America”. Italian anti-mafia prosecutor Federico Cafiero De Raho said the operations would affect the ‘Ndrangheta’s drug trafficking operations around the world, including Colombia, Ecuador and Brazil. But he warned that it was “just a first step”, saying the arrests were “nothing for the ‘Ndrangheta, there are thousands of people who should be arrested and billions that should be seized”. 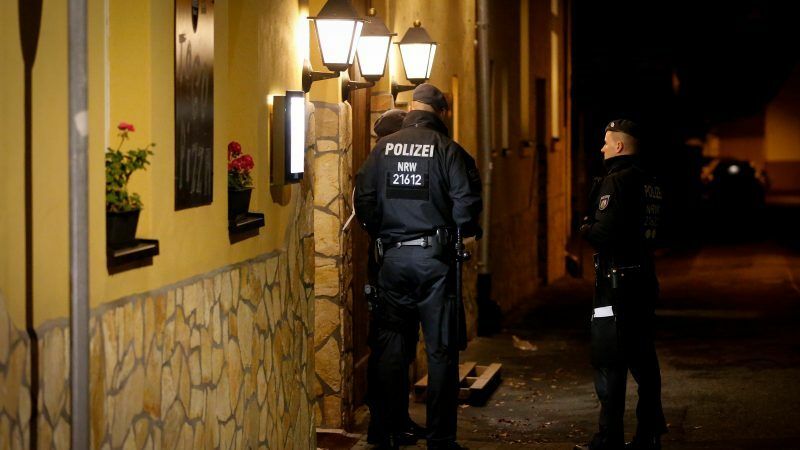 In Germany, Wednesday’s operation focused on restaurants, offices and apartments, mainly in the states of North Rhine-Westphalia and Bavaria region. Dutch prosecutors said the investigation began after they noticed money laundering at two Italian restaurants in the southern Netherlands that showed criminal links with Germany and Calabria, home of the ‘Ndrangheta. Using an often family-based network spread out around Europe, drugs would come into the Dutch port of Rotterdam and the Belgian port of Antwerp before being moved around the continent. Prosecutor Fred Westerbeke said they had also probed ice cream parlours, adding that together with restaurants “the suspicion is that the mafia organisation is laundering money through these establishments and they are used as a cover for their criminal organisations”. He also confirmed that there had been raids in Suriname, a small South American country that was once a Dutch colony. Dutch NOS television said the ‘Ndrangheta were mainly active in the Netherlands in drug smuggling through the country’s huge flower export market. The European police agency Europol said it was a “decisive hit against one of the most powerful Italian criminal networks in the world”. European Parliament President Antonio Tajani, who is Italian, sent “congratulations” to the police forces involved, adding: “Europe fights ‘Ndrangheta criminal groups”. On Tuesday, Italian police arrested new Cosa Nostra boss Settimino Mineo and dozens of other suspects in Sicily in a major swoop. Jeweller Mineo, 80, was detained with at least 45 others just before he was due to be appointed official heir to notorious mafia boss Toto Riina, who died in prison last year. So short of eliminating the “numerous village & family-based clans”………what has occured is an action against symptoms – not causes.